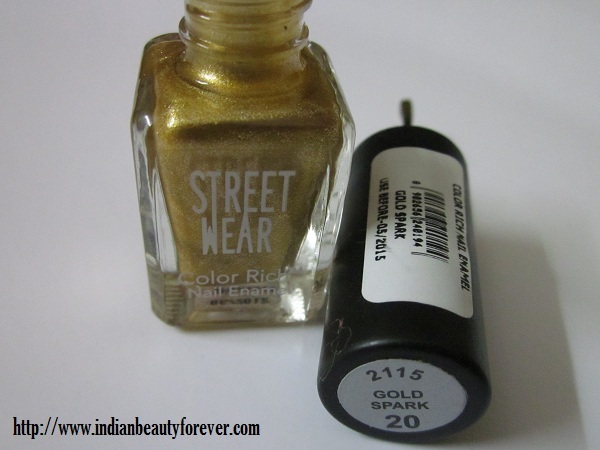 I have not tried Streetwear color riche nail paints before until, few days ago when I was shopping online..(blame it on winters in Delhi..) I bought two of these Streetwear nail paints. 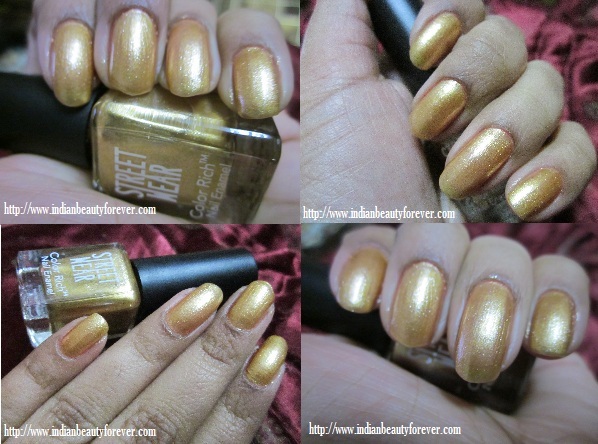 Today, I will do a short review and swatch post on this Streetwear nail paint in Gold spark. Shelf life- It says Manufacturing date as 06/12 and use before 05/15 that means 3 years.. whoa.. it won’t even last for more than 2 months, if used once a week for manicure with this. Experience- I absolutely love gold as a color in makeup like lipsticks with sheer gold shimmer, golden eye shadow or nail paints of course. Actually it’s not just me, gold color looks fantastic on most of the Indian skin tones. This color is streetwear nail paint in Gold spark which is no 20. It is a sheer color when you apply a single coat but can be build upon with more coats without looking thick or heavy on the nails. What I like is that the gold glitters are not too chunky or gritty. They are fine and does not make the coat patchy. It is gold but still it looks subtle and not too bold, can be easily carried and used for office. I would say that if you are looking for a budget friendly nail paints then do try this range from streetwear. I have got one more color, will swatch it soon. Their quantity is only 5 ml so its perfect for those who can not use an entire nail polish bottle as they tend to get bored even before it finishes. If you have used any color from this range, then please do let me know. Would love to try and how do you find this range? Hope you get the color of your liking soon. I am sure that will look fabulous on you!! Pretty! But a lot of gold polishes make my hands look dark. Thank you. I know even it makes my hands look dark sometimes when i get a bit tanned. Thank you prayati, even i like them a lot!! I love this color! Thanks for the review. Nice colour...looks good on you....and you have lovely long nails. So so pretty!! ♥ Streetwear formula too! !